The raging tempest threatens to destroy the ship, but Jesus speaks, and the storm stops. NE STORMY NIGHT a little ship tossed about on the angry waters of the Sea of Galilee. Far from the shore it had sailed when the storm broke upon it, and the sailors feared they might never see land again. With all their strength they pulled the oars; but the great waves dashed the ship helplessly about, threatening every moment to destroy it. Several of the sailors in that company had seen the rage of the sea at other times when storms swept over its surface. They knew the fearful power of such a storm. They knew how helpless they were in the grasp of this tempest. While they were wondering what to do, a great wave broke over the side of the ship, flooding it with water. Now they believed that they would all be drowned. These frightened sailors were the disciples of Jesus, and they were trying to take their master across the Sea of Galilee. Darkness had come upon them, and with the darkness of night the fearful storm broke. But Jesus, tired from his labors during the day, had lain down to rest and had fallen fast asleep. He did not know about the raging tempest, which threatened to destroy the ship and its passengers. He did not know about the fright of his disciples as they battled with the storm. But when the great wave broke over the ship, the disciples remembered Jesus, lying asleep. They rushed to him and cried out, "Master, do you not care that we perish?" Jesus aroused from his sleep, opened his eyes, and looked into their frightened faces. Seeing their alarm he arose to his feet and asked, "Why are you so fearful? Why do you have no faith?" Then he spoke to the wind, simply telling it to be still. And at the sound of this voice the tempest ceased at once, and the dashing waves grew quiet and calm. The disciples were surprised to see that their master had power even greater than the power of the tempest. They were surprised to know that even the wind and the waves obeyed the voice of the Son of man. And they asked each other, wonderingly, "What manner of person is Jesus, that even the sea obeys him?" They did not know that he had helped the great Father-God in the beginning of the creation, when the world was made, and the sea and the dry land were formed on the face of the earth. After the tempest ceased, the sailors brought their ship to the land of the Gadarenes, on the other side of the Sea of Capernaum. When they stepped onto the shore with Jesus, a man came running across the country to meet them. This man was in a pitiful state, for he was wild, living alone in the graveyard or wandering day and night through the mountains cutting himself with sharp stones and crying out in distress. Evil spirits from Satan had come to live in him, and they had made him so wild and fierce that other people were afraid of him. Even the relatives of this wild man had long ceased trying to do anything with him. For a while they had bound him with chains; but when the evil spirits would begin to torment him he would break off the chains, tear off his clothes, and run away to the wilderness or to lonely places to cry out. The wild man came to Jesus and fell down before him to worship. But Jesus knew that evil spirits were troubling him, and he commanded them to leave the man. The spirits talked to Jesus through the man's mouth, and begged that he would not torment them. Jesus asked, "What is your name?" And the spirits replied, "Legion, for we are many." A great host of bad spirits were dwelling in the poor man. No wonder he was in such a pitiful state. On a mountain-side near by a herd of two thousand hogs were feeding. The Jews were forbidden by the law to eat the flesh of these animals. But the people who lived in this land on the other side of the Sea from Capernaum kept many hogs for market, and they sent servants out to the fields to watch them. The evil spirits in the wild man did not want to leave the country, though they knew Jesus would not let them stay in the poor man any longer. So they asked to enter the hogs that were feeding on the mountain-side. Jesus gave them permission to go into the hogs, and at once the great herd of two thousand ran down a steep place and fell into the Sea, where they were drowned. The keepers of the herd were frightened, and they ran to the owners to tell what had happened. Soon a crowd of curious people came from the city not far away and saw the wild man sitting at Jesus' feet, wearing clothes and no longer acting wild and unruly. A look of peace had settled upon his face, and his right mind had come back again. Now he could speak and think and act like other men. When the people heard what Jesus had done for the man whom they had feared so much, they were greatly surprised. But they were not pleased, because they had lost all the hogs on the mountain-side. Perhaps they had planned to sell those animals for much money. Now they did not want Jesus to stay with them any longer, for fear they might lose other things. They did not think about their sick friends, whom Jesus might heal, nor about others among them who needed to have bad spirits cast out. They were selfish people, loving their money more than they loved the people who lived about them. So Jesus saw that he was not welcome, and he turned to go away. 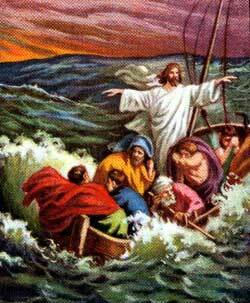 The man for whom he had done such a great miracle followed Jesus to the ship and begged to go with him wherever he went. How blessed it seemed to this poor man to be near the one who had freed him from the misery he had suffered.! But Jesus said, "Go back to your home, and tell your friends what great things the Lord has done for you." Gladly the man obeyed, and from city to city he went, telling people about the wonderful power of Jesus, until many who had never heard before came to know of the wonder-working teacher in Galilee. Put these stories on your site.